This exterior door is a four panel design with two panels of equal size placed both above and below the door's lock rail, also known as the mid rail. The panels are raised, as opposed to panels that are flush to the door's surface. A J-shaped (shaped like a rail hook) brass door knocker has been installed on the door's muntin. 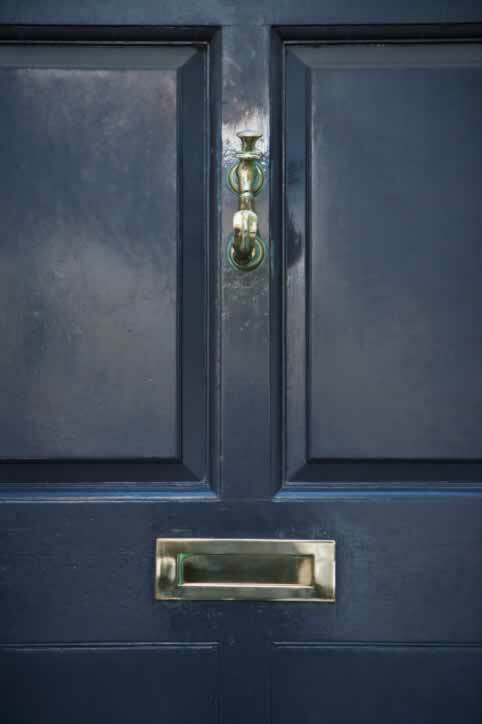 The brass plate against which the door knocker strikes matches the plate against which the knocker's hinge is affixed. Though doorbells have largely replaced door knockers, some homeowners keep them as decoration. A brass mail slot, though also a decoration for the front door, also serves as a functional piece of door furniture by providing a location for both incoming and outgoing mail. This mail slot is located in the door's midrail, centered between the panels and perpendicular to the muntin. This wooden door is painted with a black semi-gloss enamel in a smooth finish.